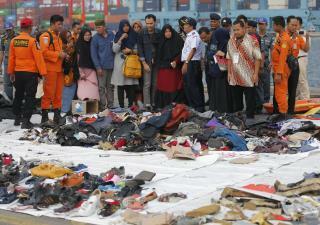 (Newser) – New insights into the October crash of Lion Air Flight JT610 have arrived via two grabby headlines, shedding further doubts on the Boeing 737 MAX's flight-control system. Reuters cites three people with knowledge of the contents of the cockpit voice recorder, describing the first officer searching for a solution in a handbook as the captain tried to level the plane. Its trim system, which usually ensures level flying, appears to have pushed the nose down based on a faulty sensor, which indicated a stall. But the pilots "didn't seem to know the trim was moving down," one source says. "They thought only about airspeed and altitude. That was the only thing they talked about." The pilots eventually switched roles, so that the first officer was flying when it was clear they'd run out of time, sources say. He then said the Arabic phrase for "God is greatest." The captain was silent. Per Bloomberg, an identical malfunction occurred on the same plane as it was flying from Bali to Jakarta on the day before the crash, though an off-duty pilot hitching a ride in the cockpit jumpseat came to the rescue. The pilot, whose presence on the flight wasn't previously disclosed, told the others to cut power to the Maneuvering Characteristics Augmentation System, which was driving the nose down, according to two sources familiar with the investigation. Following the Lion Air crash, Boeing was ordered to notify airlines about how to disable the system developed for the 737 MAX, in case of emergency. All pilots, including those on Ethiopian Airlines Flight 302, were to memorize the disabling checklist. I wonder if simulator training was made available to pilots, outlining the changes made in software so pilots could become familiar with the new plane. It seems foolish not to train pilots on the ground.